· Dolphin Pocket Cam Manager - Quick and easy management of photo downloads to your PC. Capture photos, create video files, and edit images with this simple to use photo management tool. · Ulead Video Studio - Record video to/from DV camcorders, create and edit video files, Video CDs (VCD), MPEG-1 and MPEG-2 movies. Supports MP3 audio and music recording from CDs! · NetObjects Fusion 5.0 - Powerful web site design and control! Simple point and click or drag-n-drop layout software. Incredible value for home-office business users and students alike. · Ulead Photo Express 3.0 - Create Web & print projects, add unique text and effects, and share your photos on the Web. · Ulead Photo Explorer 6.0 – Ulead Photo Explorer 6.0 is a complete solution for digital photography. Combining easy-to-use features for acquiring, organizing and sharing digital photos, Photo Explorer makes photography fun on the PC. · Ulead COOL 360 1.0 - Photo 360 degree panoramas made easy! 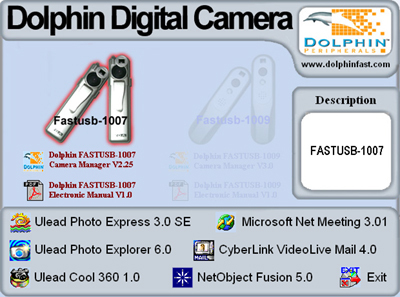 Quickly and easily transform a series of Dolphin Pocket Cam photos into 360 degree or wide-angle panoramas. · Video Live Mail Plus 3.11b - For business communications or correspondence with friends and families, use Video Live Mail to save messages in executable files adding impact, sound (with a microphone) and motion to your messages. · Microsoft Net Meeting 5.0 - Using your PC, the Dolphin Pocket Digital Camera and the Internet, you can now hold face-to-face conversations with friends and family, and collaborate with co-workers around the world.